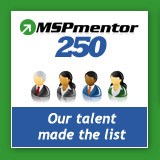 Congratulations to all the members of the IT Community who made the MSPmentor 250 List! We're proud that John Lewe IV, President and Brian Laufer, VP of Operations, were selected for this report, which highlights the "who's who" of the IT channel. Fast Facts: John is the founder, president and lead developer of QuoteWerks, one of the best known quoting tools in the MSP market. VP of Operations, Aspire Technologies, Inc.
Fast Facts: Brian has worked closely with the IT and MSP Communities to add functionality in QuoteWerks to improve their sales processes. Brian also was instrumental in influencing the ConnectWise and Etilize integrations. To see the full list, visit the MSPmentor blog.